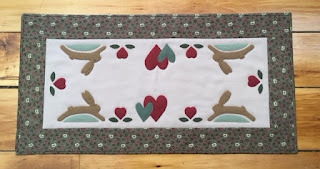 Quilting Adventures: In my defense ... ! I've been thinking about the number of quilting UFOs that remain undone and decided that I needed to do some math. From 2007 until 2017 I started 258 quilting projects (queen size quilts to table runners) of which 50 remain undone. Oh, and in that 258 total, it does not include the numerous hand embroidered towels I have stitched and given as gifts. Well, one can only work on quilting UFOs for so long until one has an uncontrollable desire to start a new project. Let's face it, I've been good at completing projects, many of which didn't have much done on it! 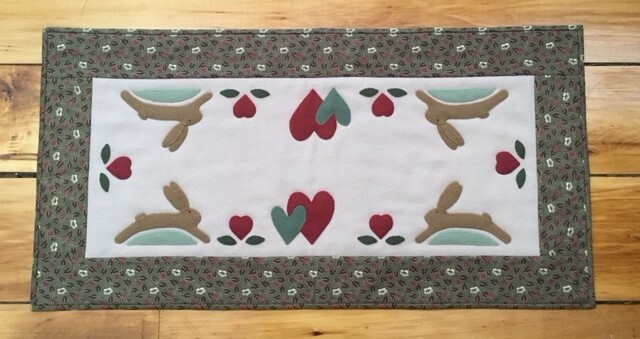 The pattern is called Bunny Luv Tablerunner by Pickering Farm. I do like how it turned out. However, I learned that I am not a fan of wool centers with cotton borders. I was perplexed as to how I would finish the runner. Do I use batting? I do not like flimsy borders, so I opted for a thin layer of cotton batting. With that, came the necessity to machine quilt so that the layers would be secured. Thank you for stopping by! Enjoy the moment! Cheers! Very cute! I love that bunny shape! I have a lot of UFO's, and some I will finish soon, but I am in the make new things mood, and plan on finishing what I start, this time, lol. I do have a lot of old patterns that I want to make too, a bit at a time. You are brave to keep count! The bunny runner looks adorable.